What does dehumanization of ICU patients look like? Why does dehumanization of ICU patients occur? How can we consider the humanity of the person in the bed? In the midst of trying to correct organ failures, clinicians may neglect to carefully consider what the patient is experiencing: to be on the brink of death, be unable to speak, be stripped naked, have strangers enter the room and simultaneously do things to their bodies without explanation, have tubes inserted into multiple orifices, have their arms restrained, hear a cacophony of disorienting bedside alarms whose meaning lies beyond them, and to be poked, and prodded—all while family is torn away. Compounding these facts, patients often have no memory or understanding of how they ended up in this horrifying situation. Encephalopathy makes it difficult for patients to make sense of the myriad painful stimuli they encounter. Patients and families must surrender all control. In all of this perceived chaos, some patients who experience critical illness may experience a loss of their humanity in the process. This loss of humanity may come in many forms, including the loss of personal identity, control, respect, privacy, and support systems, and is referred to as dehumanization (Fig. 1). Dehumanization consists of treating someone as an “object” rather than a “person” and is often associated with failures to honor dignity . ICU patients experience a devastating loss of personal identity. Instead of being identified by their names, personalities, interests, families, and cultures, patients are reduced to their room numbers, their diseases, or the treatments they receive—e.g., “512, resolving sepsis.” Personal identities are also lost by uniform standardized clothing (the hospital “gown”), inability to communicate, delirium, impaired hygiene, and absence of eyeglasses and hearing aids. Patients also lose their ability to control their environment, govern their own actions, and advocate for themselves—often made worse by loss of consciousness. When faced with a patient who is unconscious or cannot talk, physicians may enter the patient’s room without introduction, proceed to move parts of the patient’s gown and touch the patient without notice, speak to the nurse about what is going on with the patient, and leave the patient’s room all without uttering a single word to the patient. Patients with altered consciousness often report traumatic memories of their ICU stays and feeling like their bodies were not even their own anymore. Furthermore, patients often lose their family as they are escorted to the “waiting” room. In essence, restrictive visitation systematically removes from the bedside the world experts on that particular patient, in addition to pulling away the most central support system of most patients—all at the most vulnerable point in their lives. High workload and burnout may lead healthcare team members to become desensitized to the human aspects of critical illness . 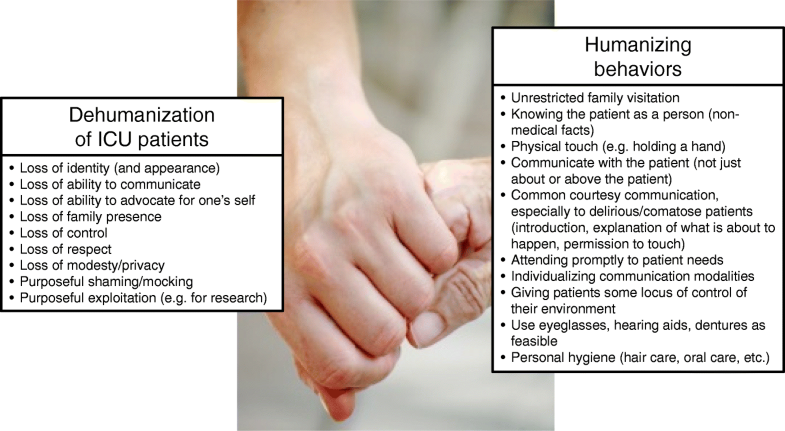 Policies and cultures of many ICUs (such as restrictive visitation) promotes dehumanization by further taking control from patients and families . Fragmented care delivery models (shift work) may also unintentionally prevent ICU physicians from getting to know their patients as people. Clinicians may not remember that patients who seem unconscious may feel and remember what they are experiencing. While ICU clinicians may have expert knowledge of critical care, few have experienced life as an ICU patient or thought carefully about what that experience might feel like. For those clinicians who have experienced being a patient, the insider experience has taught them the importance of family bedside presence, physical touch such as holding a hand, and calm words of explanation, safety, and support . Key aspects of patients’ illnesses as well as the behaviors/attitudes of healthcare teams contribute to the dehumanization of ICU patients. Not treating patients as humans risks serious consequences for patients’ physical and mental wellbeing, both during critical illness as well as their recovery long after surviving. When clinicians fail to consider the personal identities of their patients, there risks potential biases in how clinicians prognosticate and ultimately engage in decision making about life support withdrawal. Efforts to humanize the ICU may have benefits in boosting patients’ attitudes and engagement in their own well-being. Understanding and addressing patient-, clinician-, and system-level factors that contribute to dehumanization of ICU patients represent significant areas necessary for investigation and intervention in our efforts to advance the delivery of high-quality critical care.